Abstract: ntel's also been a little more playful lately, and have upgraded the on-board graphics capabilities of the DG45ID as well. Intel's updated GMA X4500HD graphics now supports high-definition video acceleration, as well as better 2D and 3D graphics support and an HDMI output capable of carrying video and audio. To get all this video processing power on to big screen TVs and high-resolution monitors, the GMA X4500HD now supports HDMI with audio, a feature that has been integrated onto the Intel DG45ID motherboard. Using the G45 Express chipset, the DG45ID can output high-definition content over its HDMI port at 720p, 1080i or 1080p resolutions, with support for HDCP as long as its plugged into an appropriate display. Let's be clear, the Intel G45 Express is an integrated video chipset made with High Definition content playback in mind, not 3D gaming. It handles better than the previous IGP generation of course, but is still woefully underpowered for the majority of modern games. This is the very reason the Intel G45 Express offers users a 2nd generation PCI Express x16 connection for discrete videocards. The Intel G45 northbridge is built on a 65nm die, while the previous generation G35 and G33 chipsets were built on more power-hungry 90nm processes. 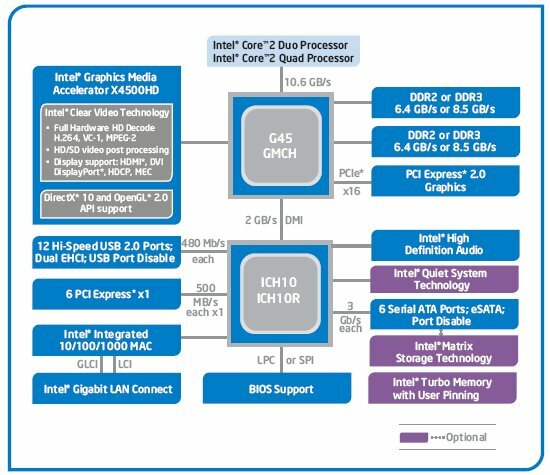 The P45 and G45 chipsets are also the first core logic to be paired with the Intel ICH10R southbridge. Intel's G45 Express officially supports socket 775 processors from a front side bus of 800MHz to 1600 MHz inclusive. Memory support has also been expanded - certain motherboards, like the Intel DG45ID being reviewed today, can accommodate up to 4GB of DDR2 RAM at 667/800/1066MHz speeds, which provides the kind of flexibility needed for overclocking. Next PCSTATS will test the HD playback capabilities of the Intel DG45ID and the G45 Express chipset. Playing high definition content on current generation PCs can bog down even the fastest processors because there is more data to handle. To test the integrated graphics processor's capabilities at HD content accelerating capabilities, we played the High Definition video clip, "The Discoverers" at 720P and 1080i from the hard drive while monitoring the percentage of CPU utilization through Task Manager. Lower results are better. Intel's GMA X4500HD stays very competitive when playing back High Definition content off of a hard-drive, off loading almost all of the workload to the IGP. Intel's worked hard to increase the compatibility and codec support for the GMA series in the past few months, and it looks like things are really starting to pay off. Blu-Ray High Definition content demands a lot of PC processing resources during playback, if CPU load becomes too high that can lead to jittery video quality or other artifacts. Many integrated graphics processors now feature Blu-Ray and High Definition H.264, VC1 and M-PEG2 content acceleration decoders to offload this processing from the CPU, freeing up system resources for other tasks. The PCSTATS Blu-Ray HD content playback test scenario monitors average CPU utilization. It's simple and to the point. The motherboard's integrated graphics processor is taxed in the same way it would be in your home theatre environment, and average percent CPU utilization monitored with Windows task manager. Lower CPU utilization values are best, provided video playback remains smooth and stutter free. Each integrated graphics motherboard is connected to an ASUS MK241 wide screen 1920x1200 (1080P) resolution LCD display with an HDMI cable. The Blu-Ray movie "10,000 BC" (VC1 encrypted) is then played back from Chapter 22 on an ASUS BC-1205PT Blu-ray combo drive, using WinDVD Platinum software and the average fluctuation of CPU load recorded. Pg 11. Intel X4500HD Graphics - Sooth HD Playback?